Like most children her age, 2-year-old April Tognoni loves playing dress-ups and dreams of one day going to Disneyland. April was also a very sick little girl – her incurable condition known as Dravet syndrome, a severe form of myoclonic epilepsy, was causing more than 1000 seizures a day. But now, thanks to parents Jessica and Paul turning to cannabis oil in a last-ditch bid to manage her attacks, April has made a miraculous turnaround. “My little girl is smiling and for the first time she can look me in the eye,” says Jessica. “I challenge any parent who says they wouldn’t do this to save their child’s life. After initially taking the oil every three to four hours orally through a syringe, April now only has the treatment in the morning and at night. 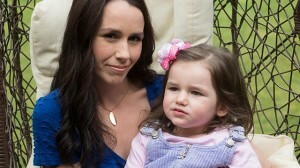 As a result, she now has as few as six seizures a day. Cannabis oil is low in the marijuana compound that’s psychoactive but high in cannabidiol (CBD), which is believed by many to have medicinal properties. Scientists think the CBD quiets excessive electrical and chemical activity in the brain that causes seizures. At their wit’s end, Jessica and Paul agreed to try it after watching an American TV show featuring an epileptic child whose symptoms were also eased by cannabis oil. “When it’s life and death, you want to give your child the best chance,” says Jessica, also mum to Jonah, 6, Matilda, 5, and 10-month-old Alessandro.